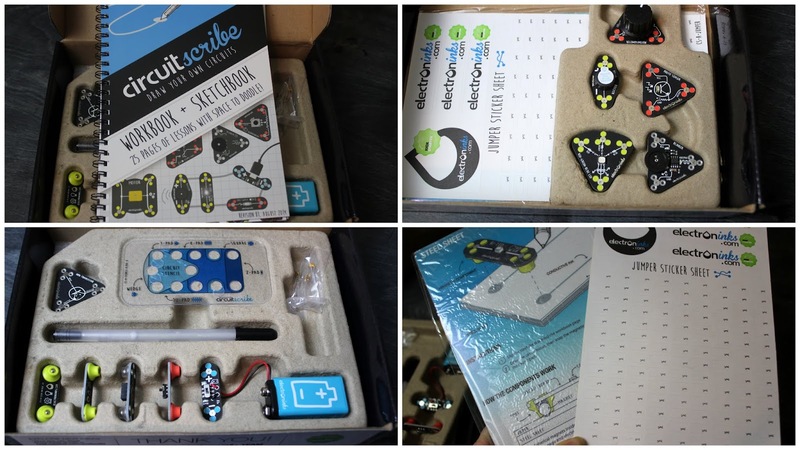 Circuit Scribe Review - Ink Pens that Draw Circuits! Perhaps the most exciting science products I've seen this year comes from a recent Circuit Scribe review. I am blessed to be living in a time when we -- as parents -- have an unprecedented number of quality products and toys that help teach basic science concepts in a fun and engaging way! Learn more about this fantastic, non-toxic, conductive ink that you can use to draw circuits! They are probably one of the hottest -- and best -- STEM products out there. When I first saw these pens on YouTube, I did NOT believe that it would be so simple to use them. We were asked to review the Maker Kit and the smaller Mini Kit, and I was blown away by how very, very cool they were. This may be the toy of the year! ​Look what comes in even the smallest "Mini Kit". You get the pen, filled with special ink, the components to do the activities (including the battery), and directions for doing several fun and simple experiments. Here's me doing the first one. I simply connected the LED light module with the battery module by "drawing". I could even doodle in the space below. As long as the ink connected, the hope was that my LED would light up. ​This very brief video shows me placing the battery and light on the circuit for the first time. As you can see, placement is key. Both came with little "feet" on the bottom that need to sit on the circular shape of the circuit. It's important to color in the circuit large enough to conduct, but if you can fill out circles on a standardized test, you've got this! All of this comes in the Mini Kit, which is priced very, very nicely at a mere $9.99. Can you say "stocking stuffer"? ​We also tried out the much bigger, involved, and challenging kit - The Maker. This thing has it all! Lots of activities for hours of hands-on learning and exploring. This was the best thing I've seen offered to both kids and adults interested in learning electrical principles in a very long time! Is Circuit Scribe a toy? A learning tool? Who cares!! It's so much fun and you learn without trying. I'm a big fan after this Circuit Scribe review, and I look forward to building our kits and also buying the replacement pens down the road when we've run out of ink. At just $20 a pen, it's a sustainable way to play and learn for years to come. Learn more about Circuit Scribe products at their website, or check them out on Facebook, Twitter, and Instagram.